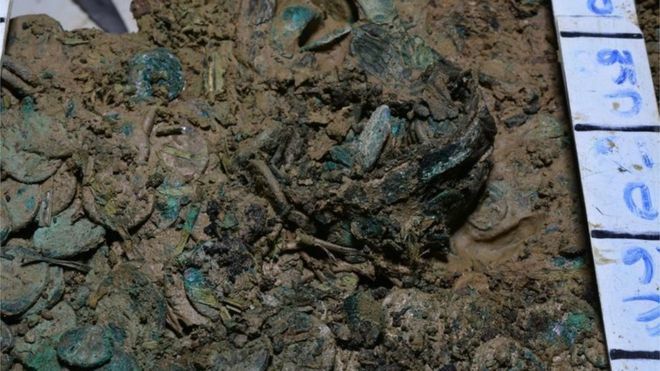 an estimated 70,000 coins in the hoard". The Jersey hoard was found in a field by metal detectorists Richard Miles and Reg Meade in 2012. The leather purse is about the size of an average palm and is described as an important find by senior conservator Neil Mahrer. He said they have so far removed some 40,000 coins and this was the first bag they had come across. Mr Mahrer said: "It is made of leather, it looks like it is either made of one sheet or bootlace strands. "It is about 8cm across and 4cm deep. It is joined at one side to two rings that could have been for fixing it to a belt." [...] He said they would be removing all the coins surrounding the purse so they could then remove it with the earth in a single block. So a bit like a small Sainsbury's orange shopping bag, then? 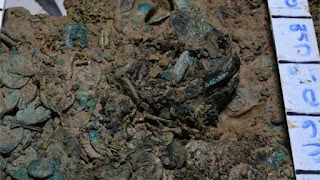 The Lenborough Hoard was also found in a field by metal detectorists, but was tipped out loose onto a farmer's kitchen table the same night. As are many other hoards found in a field by metal detectorists in England and Wales.